Here is the second half of my Early War "Poland 1939" project, which was started last year with the September Campaign v.2 Orders of Battle book. Finished most of it during the Christmas/New Year weeks and ended the project just yesterday. "Poland in Flames" is a historical campaign book containing 70 scenarios divided between 16 operations taking place during the invasion of Poland in September 1939. Players will be able to recreate pretty much every battle of importance. The book includes opearations played through the point of view of Polish, German, Soviet and Slovak armies, and linked either thematically or geographically but all being written in a chronological order.The book also includes historical background about each battle and operation, historical background on important commanders and decisions, maps showing troop movements and mini maps of Poland so that players can get a general idea of the geographical location where the battle is fought. Though written for Flames of War, I beleive the content should translate fairly easily to other rulesets if you prefer to use it with another game of your choice. And just as with the September Campaign this book is a non-profit fan made supplement, and as such a free to download resource (meant to be used with my September Campaign v.2 OoB). That is also my contact email if you have any questions regarding the content, in which case put "September Campaign" in your email title. 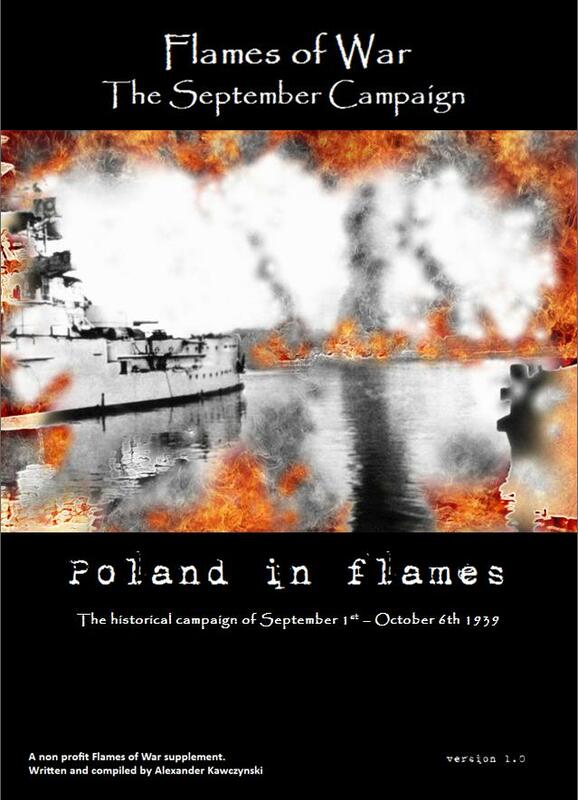 PS, there will be a compilation PDF of September Campaign+Poland in Flames up for download shortly. I just need to format it all together. Thanks, I really wanted to finish this project and the blog break freed up a lot of time (it did help that I basically did nothing else but write this book up until yesterday). Gratuluję i podziwiam, za ogrom pracy włożony w ten projekt.